Tammy and Acacia were out of the house for the night, so I made the executive decision to go ahead and rivet on the stiffeners to the skins without priming them now. I will prime them with the rest of the parts later on, so that means there will be a small section of metal that is not primed, between the stiffener and skin, but it is alclad so I am not too worried about it. 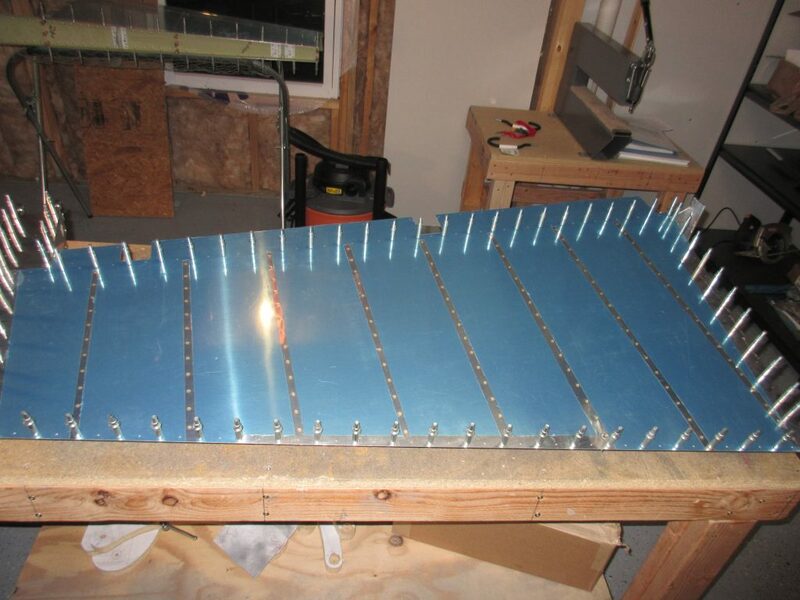 I started out by dimpling both the stiffeners and the skins using the DRDT-2. The thin .016 skin dimples incredibly easy, so I was ginger with the force. 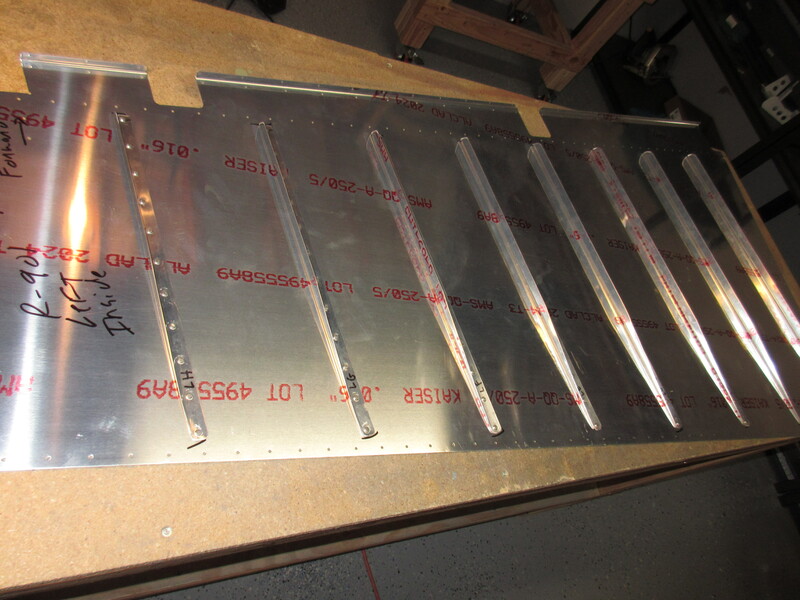 Then I back riveted the stiffeners onto the skins, being sure I kept the work on the back rivet plate. I wished I could back rivet the whole plane! The rivets came out looking perfect. 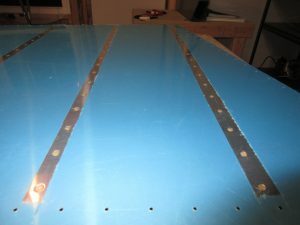 I had previously built the rudder skeleton, so the next step was to cleco on the skins to the skeleton and then match drill all the remaining holes, including the trailing edge wedge. I cleco’ed every other hole so I could drill perfectly aligned, and then moved the clecos to their neighbor hole and drilled where they were. 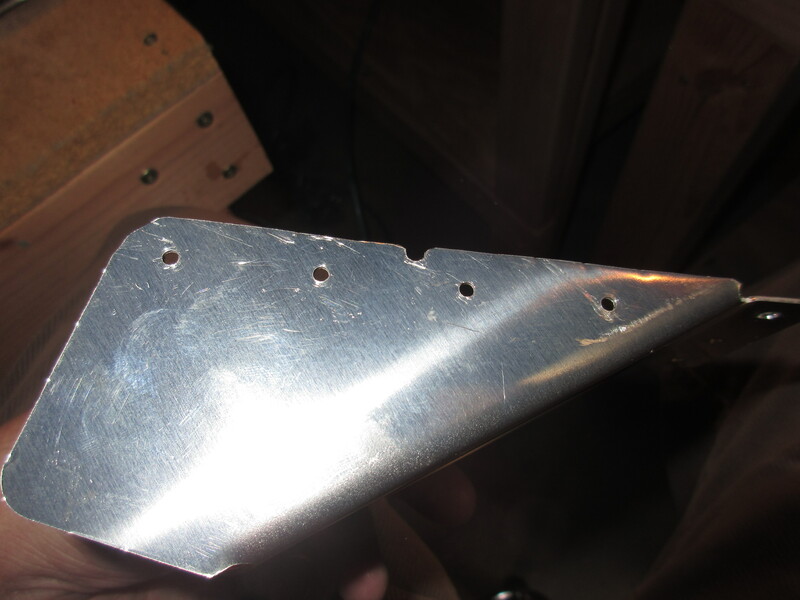 Now that the rudder is assembled, the plans has us fit the R-710 rudder brace and then back drill it to the skins lower holes. First we have to trim away a little excess on the part, as noted in the plans. There are notches and holes that can be used as a reference to trim, but after reading from several other builders, I opted to trim on the outside of these lines to give myself some extra metal in case I have edge clearance issues. Other builders noted that if you cut along the notches, you an run into edge clearance issues after you drill the holes. The above photo gives a better idea of what I am talking about. 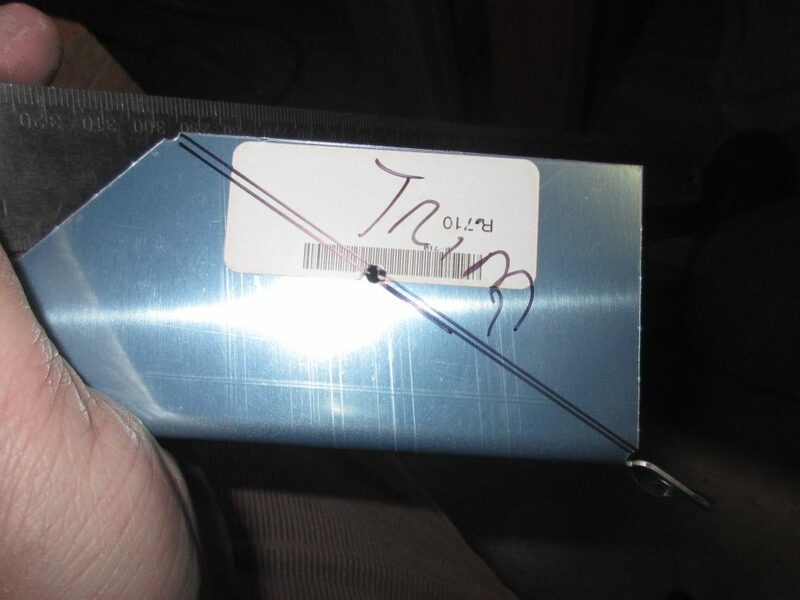 The bottom line in the line Van’s has you trim, where I opted to give a little extra as you can see from the top line I drew. Thats the line I trimmed along and it worked out really nicely. I have plenty of edge distance for all the holes, and I will just file down the edges to make them smooth and get rid of that notches when I deburr and edge dress all the parts. 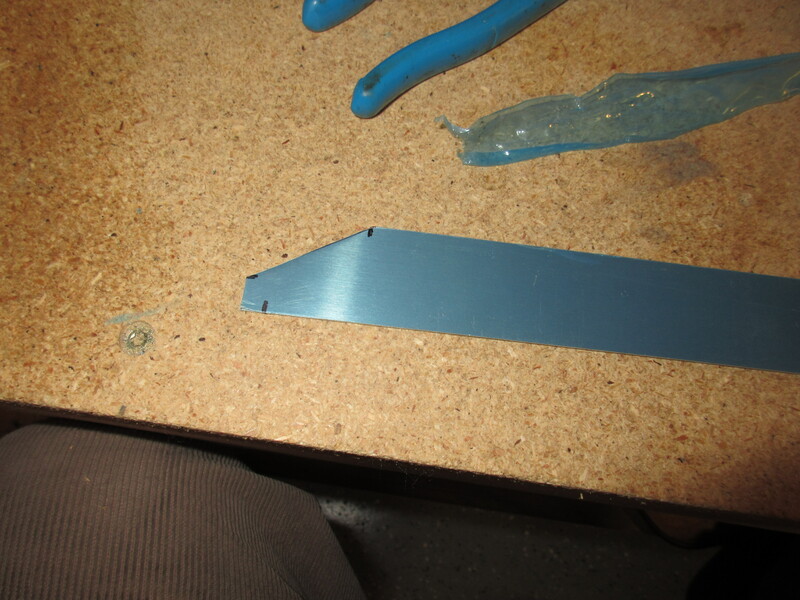 I then clecoed this part to the skeleton so I could complete the next small bit of fabrication. Next up is to fabricate the R-918 rudder bottom attachment strips. These are strips of .032 that gets riveted onto the bottom of the skeleton to provide a flange for the fiberglass bottom cap to attach to. Van’s ships about 40″ of .032 that is already cut to the 1 1/8″ width, so all I had to do was cut them to 18″ long and then trim out the little notch as noted in the plans, which as easy enough to do. 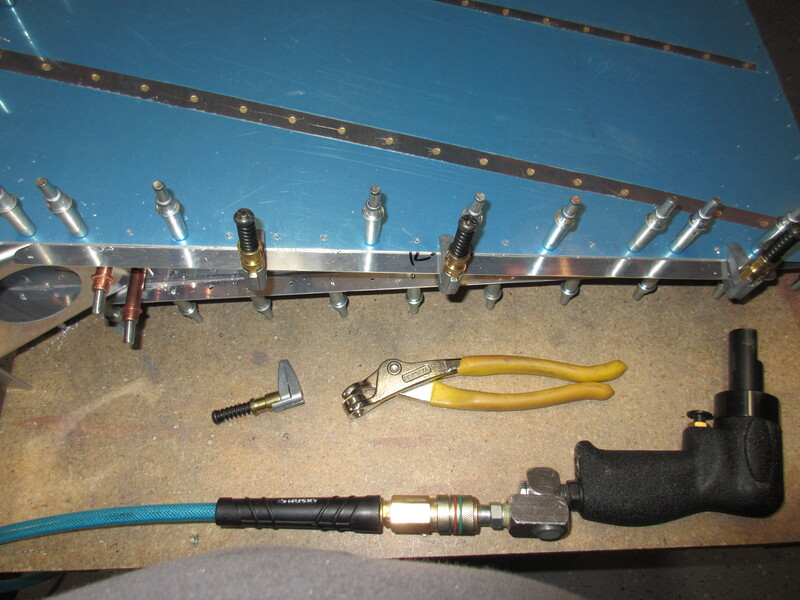 Once you have both sides fabricated, we use cleco side clamps to hold them flush along the bottom of the rudder, onto R-904 rib. Then, back drill each one using the holes in the skin as a guide. I was careful that I didn’t run into edge edge distance issues and used a Sharpie to mark the holes and check they were not to close to the edge. Once I was happy, I drilled them. I completed both sides of the R-918 and decided that after 6 hours of working on the rudder today, I’d call it a night. Tagged Dimpling, Rudder. Bookmark the permalink.